The MC300RL is a machine that is ideal for use in small commercial coin laundries and car washes for use in self-serve bays or for vacuums and vendors. 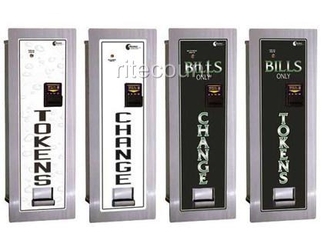 With one steel coin hopper, holding up to 3,200 quarters or tokens, and the solid welded steel cabinet has a stainless steel face-plate for added security. Many customers have used the MC300RL as a supplemental change machine when their wall space is limited, or they just need a little more capacity for busy weekend locations.